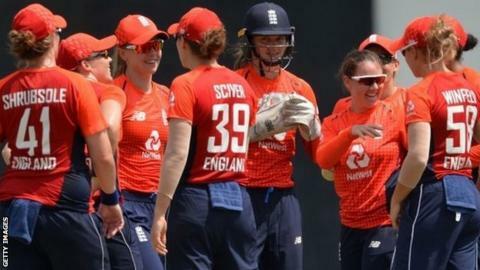 England's women cruised to an eight-wicket win over Sri Lanka, dismissing the hosts for just 94 in the first Twenty20 international in Colombo. Opener Tammy Beaumont hit an unbeaten 50 to pass 1,000 international T20 runs as the tourists knocked off the target in just 14.2 overs at the P Sara Oval. Spinner Linsey Smith took 3-18, her best England figures in this format. And Anya Shrubsole's 2-20 meant she overtook Danielle Hazell to become England's leading T20 wicket-taker. Shrubsole now has 86 wickets at an average of 13.96. "I'm really happy to get to 50 and to pass 1,000 runs but it's all about the team and the most important thing was getting off to a winning start in the series," said Kent batter Beaumont, 28. "I'm delighted for Anya as well. She and Dani are very good friends so I'm sure they'll enjoy swapping places at the top of the wicket-taking chart." Victory in the opening match of the three-game T20 series followed England's 3-0 one-day series whitewash. The next match is on Tuesday at 04:30 GMT. On another hot and humid Colombo morning, this was very much a continuation of the themes that developed throughout the one-day internationals: England dominance and Sri Lanka batting frailties. There were real positives with the ball in particular. Linsey Smith's 3-18 came in a spell that showed her growing confidence, and there was encouraging resilience from debutant Freya Davies, who conceded early boundaries before fighting back to claim two wickets. Beating Sri Lanka comfortably on this tour was not unexpected, but it is no mean feat for England to have now won eight on the bounce in the Indian subcontinent. This is now their joint best run during Mark Robinson's time in charge.